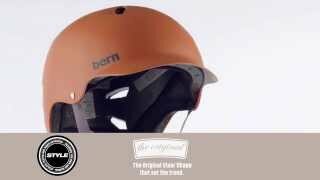 The Bern Bandita Thin Shell EPS Kids Helmet is designed for tweeners, not quite small enough for a kids helmet and not quite big enough for the adult models. Designed after the Lenox, the Bandita uses Bern's original visor shape and styling and scales it down a bit. Utilizing the EPS Thin Shell technology the lightweight burly construction is certified to protect you whether you're on a bike or on the slopes. The summer model comes with a summer liner that will keep their head and ears cooler in those warmer summer months riding around the neighbourhood, but in the winter, can easily be transitioned to a snow helmet with a separate accessory winter liner.